When laboratory work and research requires accuracy to the hundred-thousandth, there is simply no room for error. 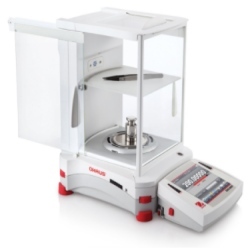 The Ohaus Explorer series of semi-micro balances has been designed with the technology to ensure that your very specific weighing results are accurate. Sophisticated laboratories requiring accuracy and looking for innovative technology to obtain measurement results can find both in Explorer semi-micro balances. Geared for high-performance with up to 0.01mg readability and capacities up to 220g. The AutoCal™ Internal Calibration system ensures accuracy of results in applications that require high precision.